We have served the children of Baba Nyumbani for more than eight years, providing leadership and direction to children and staff and caring for their physical, emotional and spiritual needs. We foster good relationships and love between the children and their group parents and pray and nurture them in God’s way. When they have problems, we help their group parents find appropriate ways to guide them on the right path. We also work with management and submit monthly reports on all developments with the children and the staff teams. 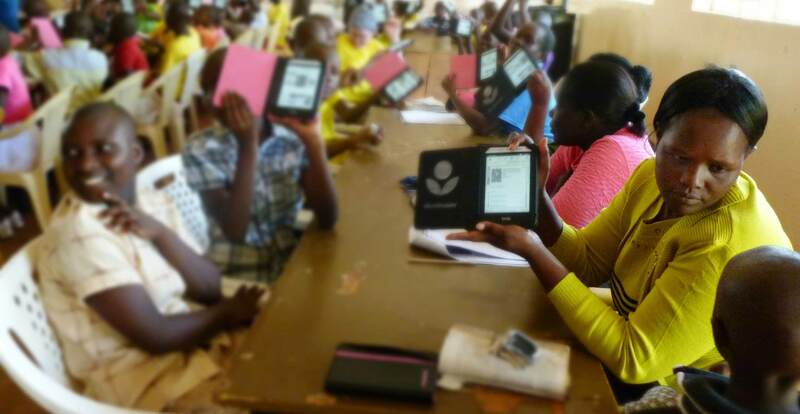 Milka (R) works with one of our children during a recent e-reader training. There’s a tremendous spirit of teamwork within the Micro Community, a heart and willingness to help the children become self-sufficient, which makes our work enjoyable. It is very satisfying to see children who had no hope for the future find the assurance of living a good life and impacting the world. We also enjoy instilling knowledge and helping children with their studies. We teach a range of skills, including everything from working on the farm and helping in the kitchen to self-grooming and playing the keyboard. The hardest part of our job is dealing with those instances when children rebel or misbehave. Seeing a child attain good grades and pursue the career they desired makes up for those times. The knowledge, skills, education, and salvation the children receive at Baba Nyumbani are great tools of transformation and change in our community and beyond. We’re very grateful to our sponsors for supporting the children and to our teams at Horizon for work well done. Support our mission to rescue, restore, and empower orphaned children.